far journeys, after he had sacked Troy's sacred citadel. Of sacred Troy had sackt and shiverd downe. Himselfe and friends in their retreate for home. after he sacked Troy's sacred citadel. to bring his comrades back. Striving for his life and his companions' return. Tell me, Muse, the story of that very resourceful man who was driven to wander far and wide after he had sacked the holy citadel of Troy. He saw the cities of many people and he learnt their ways. He suffered great anguish on the high seas in his struggles to preserve his life and bring his comrades home. Muse, tell me of a man: a man of much resource, who was made to wander far and long, after he had sacked the sacred city of Troy. Many were the men whose lands he saw and came to know their thinking: many too the miseries at sea which he suffered in his heart, as he sought to win his own life and the safe return of his companions. First, a note about the original Greek poetry of The Odyssey. In Homer's time the predominant metre was dactylic hexameter, which places six beats in every line, each measure being a triplet of syllables with the beat on the first one. So the line goes: dum-da-da dum-da-da dum-da-da dum-da-da dum-da-da dum-da-da. Now this may sound wonderful in ancient Greek, I don't know. But in modern English it's awkward. One anonymous reviewer of a translation that uses this form says it resembles "pumpkins rolling on a barn floor". Few translators, apart from Richmond Lattimore, attempt an English hexameter version—and Lattimore at least drops the dactylic part. Lattimore does manage to pull it off in his acclaimed translation of 1965–67. It is both majestic and very faithful to Homer—though perhaps also more of a challenge for a reader who is intimidated by long lines of poetry. It's my personal favourite, but it's not for everyone. You may prefer any of the other noted renderings of modern English translators over the past four centuries. 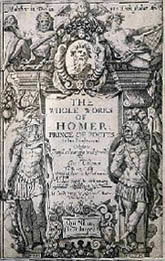 The first poetic English translation of note was by Shakespeare's contemporary George Chapman, whose combined volume, The Whole Works of Homer Prince of Poets, was published in 1616. Chapman's verse is in rhymed iambic pentameter (da-dum da-dum da-dum da-dum da-dum) typical of the Elizabethans, and is quite creative if not always faithful. Like his Iliad, it was the version for a long time but is seldom read today, possibly because the language of that time appears archaic to our ears. Alexander Pope also carried on from a translation of the Iliad to The Odyssey in 1725 with rhymed couplets in iambic pentameter. It's lovely and it's the version that you often find quoted. But the convolutions necessary to fit Homer into this form makes the story hard to follow. Pope's translation is free for downloading or copying on numerous Internet sites. A more recent attempt at pentameter was by Allen Mandelbaum in 1990, who doesn't try to match his lines exactly with Homer. His style is plain and almost as easy to read as prose. In 1961 Robert Fitzgerald issued his prize-winning translation of the Odyssey into unrhymed poetry with lines of irregular length. It became the standard choice for many years. The 1967 version by Albert Cook uses verse with long lines to accommodate Homer's hexameter but it is not rigid in its rhythm. Lines are stretched or compressed by one or two beats, whatever works best. Still it matches Homer's verse line for line and is considered linguistically accurate but more readable than Lattimore's hexametric verse. For these reasons, Cook's translation has been widely used in schools. Robert Fagles repeated his Iliad success with his 1996 translation of the Odyssey into unrhymed verse with lines of uneven lengths. It seems to be the current critical favourite. Stanley Lombardo is another old Homer hand with a translation in 2000 of the Odyssey into irregular lines organized into stanzas of irregular length. Not every translator tried to meet the challenge of converting Homer's verse into modern poetry. Emil V. Rieu had an enormous hit with his easygoing translation of the Odyssey into prose that launched Penguin's book line in 1946. The version you're more likely to find has been revised by his son, D.C.H. Rieu, to retain its feeling while improving its literal accuracy. Another up-to-date prose translation for Penguin is that of Martin Hammond in 2000, which has received good reviews. But don't expect colloquial English. Even in prose this translation retains some of the sentence structure and formality of old poetry—which may be considered a positive (with the sweep and dramatic presentation of the great epic) or a negative (with more flowery and repetitive expression). Best for reading aloud in my opinion. Da-dum! Dozens of other translations of The Odyssey are also available in all styles of prose and poetry.